Discussion in 'Lake Mountain' started by rollyz, Jul 5, 2007. Where are all the old Ski fields in Aus? Got any old pics when they were active? Got any current pics? And, for a bit of fun, (and a possible lot of hiking), try and ski some of these old slopes. Post pics here if you achieve any. I know of a tow at Cabramurra. Think there was one around Kings Cross. Will have to try some old slopes up near Corin. cin, Vermillion and Highplainwarrior like this. Gosh Rolly asks a lot of difficult questions. But this time I've already done the research. - Mt Donna Buang, Vic. Four ski lodges and cleared runs before WWII. Thanks Rolly. It took me six months to assemble all that! Thanks for the feedback. I may digest it all into a table format to make for easier browsing. I just remembered that Mt Wellington in Hobart was popular before the war too. After the war, skiers abandoned it for Mt Mawson (also known as Mt Field or National Park or Lake Dobson). I'm not as good at NSW ski history as I am on Vic and Tas, but in the 1940's people were running popular ski accommodation in the block of freehold land (or long term leasehold?) east of Jagungal. The name is on the tip of my tongue, but I'll leave it to someone else to look up. Bogong, do you know anything about the ski tow at Round Mountain? 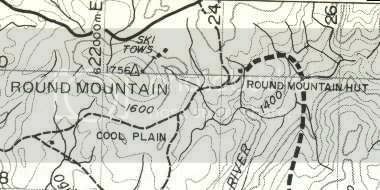 It is shown on maps in the early editions of Snowy Mountain Walks by the Geehi Club (I have the 3rd and 6th editions here). No mention of it or the associated structures in the KHA huts list however. Next time I am in the area I will have a scratch around for any relics. 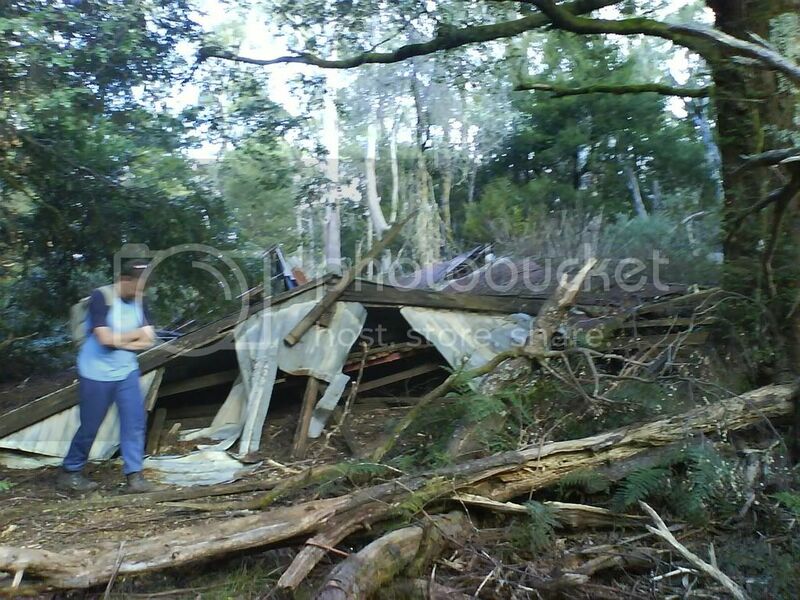 The KHA huts list also mentions Montagues hut near the Tooma Reservior being used as a ski tow shelter by the SMA. Haven't checked out this site either, and information seems to be hard to come by (hut burnt down in 1986). In the past there were lodges located almost on the park boundary in the vicinity of Cesjacks Hut, but the land was resumed by NPWS. I spent some time looking for the remains of some of the lodges (Nordheim, Katingal & Bogong) two years ago and found very little. Another building called Jaanga was located further to the north; I haven't attempted to locate this yet, however a photo and some info on this building was published in the KHA newsletter a few years ago. A book was written about the whole land resumption ordeal called 'On the edge of the wilderness' by Brian Haig; I haven't tracked down a copy yet. There are still lodge(s) located in the Snowy Plains area east of Jagungal. Would love to find out more about them! Craig, I love your avatar, it's brilliant! Thanks for the info on the Tooma and Round Mountain tows. I assume this is the Round Mountain on the sealed Corryong - Kiandra road? Just when I get too confident that I've nabbed all the old rope tows, someone tells me about two more! There are ads for the east of Jagungal ski lodge in late 1940's copies of the Australian Ski Yearbook. PM me if you really want details or photocopies. Actually, if you want to do some amateur ski archeology, there is one remaining ski lodge at the bottom of the former main Donna Buang ski run. It's collapsed, but everything is still there. Before the war there were at least four ski lodges at Donna. One or two were toasted in the 1939 fires, one or two were shifted to Buller in the late 1940's, but this one appears to have been abandoned. At the moment, I have no idea who it belonged to. Does anyone know? These photos were taken on a phone, so they're a tad rough. Thanks Bogong. I stole my avatar from another forum when I started uni a couple of years ago. Alas, my days of living on government handouts are numbered, as I finish my course at the end of this year! Yep, the Round Mountain in question is the one just to the south of the Khancoban - Cabramurra Road. Below is a scan of the map from the 6th edition of Snowy Mountain Walks (1983). I suspect the tow would have been removed by then, as it is not shown on the 3rd edition of the Kosciusko 1:100k map (1982). It would have been a great location for the tow, as Round Mountain is covered in stunted snowgums and a bit sparse on top (easy clearing). 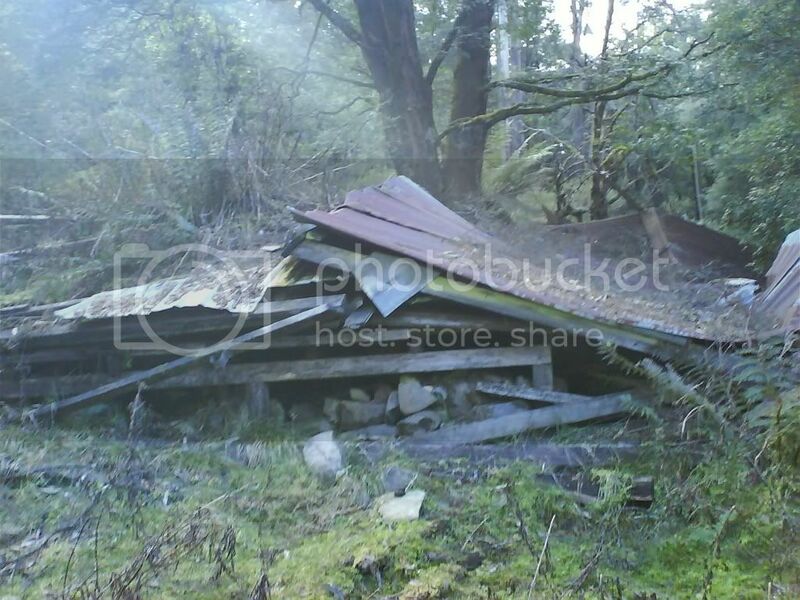 Will definately explore this location during the summer. Here is a scan of the 1:50k Khancoban map showing Montagues hut. No doubt both tows were associated with the Snowy Mountains Scheme. I don't remember reading anything about the tows in any of Klaus Hueneke's books, but they may be mentioned in some of the books on the Snowy Scheme. I've already pulled out my books and maps. The earliest edition I have of the Geehi book is the 5th ed, 1978. I can't find anything relevant in my Snowy Mountains history books, yet to check Snowy Hydro books, but now I know it was there, I will eventually find something. But you have to be sceptical about the Tooma ski lift at 1,300 metres altitude so far north. In Victoria, it's possible at that altitude, in Tassie they are quite common, but at the northern end of the Snowy Mountains? In the meantime, I've added Round Mountain to the Wikiski non resort ski tows page as a definite and Montague's as a possible. I share some of your scepticism about the Tooma ski lift. I imagine would have only been in place whilst the dam was being built. However we must remember that throughout Hueneke's books there are references to people such as Ted Winter skiing regularly to Pretty Plain Hut, which is only at 1400m. As the likely slope faces south it would retain snow fairly well. 'Lodges' may be a bit of a stretch for a few of those CraigD. Katingal is on private property and is labelled on the Series II Dept Lands maps as 'Katingal'. Kore Grundsun (sp?) (XC legend, Snowy hydro migrant worker, stonemason, ex of Eucumbene Cove) is the previous owner, now owned by a group of folks. My folks have done some XC trips in the past with Kore there. Nice spot. Dunno how it did in the big fires. I have read Brian's (somewhat bitter) book as part of my honours thesis. Try UNSW library ? I don't know Nordheim or Bogong. Does Klaus Hueneke's book mention them? Thanks for that information climberman. I'm no expert on the Snowy Plains area, but have walked through there a few times. Beautiful place. Klaus Hueneke's books briefly mention Brian Haig and Bogong Lodge. Will try the UNSW library for his book. Here is what the KHA Huts List (1997) has on the buildings. Nordheim - Built 1976-7 by Kore Grunnsund, Brian Haig & others on land then outside the Park being brought by Haig. Accidently burnt 1979. 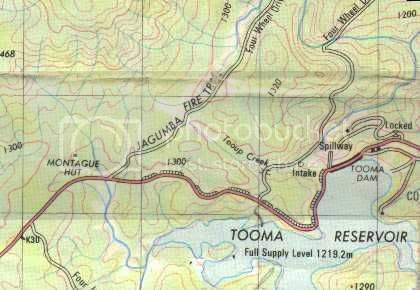 GR 311983 on the Khancoban 1:50k map. Paddy Pallin briefly refers to this lodge in his book 'Never Truly Lost' on p217. Katingal - Built 1977 by Kore Grunnsund on land then outside the park being brought by Haig. 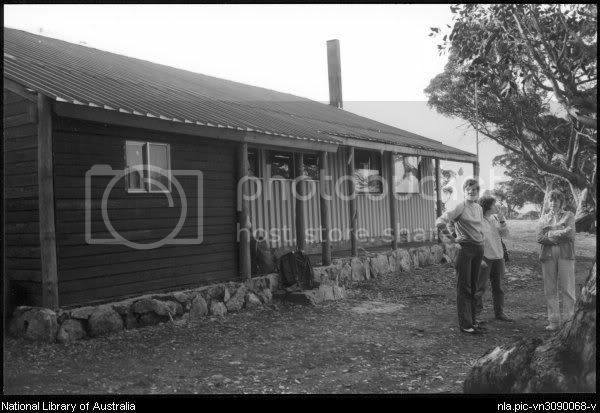 Relocated outside Park in Gungarlin Valley 1979. 1 room, iron roof, stone & timber walls. Marked & named at GR 311984 on Khancoban map. Bogong Lodge - Built 1978-9 by Brian Haig, Renzo Dalmaso and others for sking on land then outside Park being bought by Haig. NPWS resumed land 1985, destroyed lodge 1987 amidst legal & financial wrangling. 5 rooms, iron walls & roof, wooden floor on concrete slab. GR 312984 on Khancoban map. Photo below is from KHA collection at the National Library; click for full size. The only remains I could find in the vicinity where these buildings were was a sheet of iron (looks the wall cladding in the above photo), a smaller piece of rusty corrugated iron and a couple of small lumps of concrete. Couldn't even say exactly where the buildings were! NPWS must have done a very thorough job of cleaning up the site. Jaanga - Built 1976 by members of Sydney Bushwalkers for skiing, on land then outside Park being bought by Brian Haif. NPWS resumed land 1985, removed roof 1989. GR 314996 on Khancoban map. Below are the other skiing-related buildings in the Snowy Plains area. I haven't been to any of them. Kore Grunnsund's - I assume this is Katingal? Not sure of its location. Kore Grunnsund's New - Looks rather fancy. Unsure of its location. Bulls Peaks Lodge - This is marked & named at GR 313966 on the Jagungal 1:25k map. Clearly visible from the old vehicle track that heads from Cesjacks along the crest of the Great Dividing Range towards the Bulls Peaks. Snowy Vale - Not marked on any maps, and I'm not sure of its exact location.. Built prior to 1991 - could this have been a replacement for the buildings lost when the land was resumed by NPWS? Photo below courtesy Gary Duncan; click for full size. Snowy Vale Upper - As above. Apparently burnt in the 2003 fires? I think Haig took a bit of a punt. Happened at a very peculiar time in NPWS internal politics - very much the start of the big shift to closing access, reducing human visibility, testing legislation. Thankfully in NSW that has been largely reversed and quite a different policy set exists for the most part in the NPS of DECC. In the times when few people had cars, Donna was the closest reliable snow to Melb. (Not reliable any more ). In the late 1920's people took the train to Warburton and hired a "charabanc" (looks a bit like a strech convertable car with 4 rows of seats) to take them up the mountain. Clubs that built lodges in the early 1930's included University Ski Club, Ski Club of Vic, and a couple of others that I can look up if anyone really wants me to. Big working bees were organised to clear runs including the main run east from summit, which still exists downhill from the dunny block. The ruined lodge (see photos above) is at the base of this run. They also built a proper wooden ski jump, but I'm almost certain there was never a ski tow. Other Donna stuctures. There have been three towers on the summit. The first was four tall tree trunks with a platform nailed between them high up. The second was an old mining "poppet head", the third is the current tower with the strange double helix staircase. You win thread mining championship, nearly eight years old! Lake Mountain have a couple of old ski runs listed on the old broadbents maps of Marysville in Victoria. I believe Ski run 11 used to exist in the snowy paddock area, and Ski run 21 was located 200 mtrs SSW of Gerraties car park. I remember visiting both in the early 80s. not sure about before then, but I don't think there were any ski tows. Both areas were closed mid to late 80s probably because they were to steep? About the same time they banned the use of thin plastic sheeting. Hopefully someone can give us some earlier history on the area? I have seen these remains too, and wondered about the history behind them. Great thanks for the information Bogong. 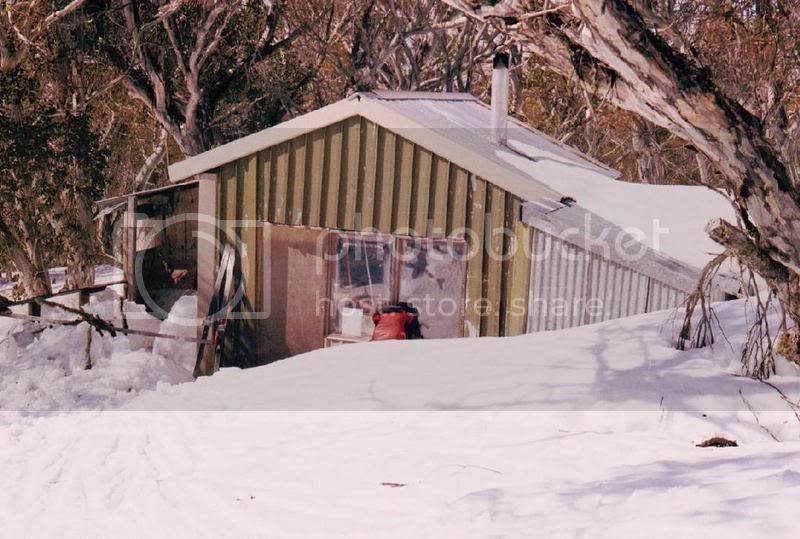 I have done some further digging on the two old ski runs at Lake Mountain, and discovered there was 3 huts at the bottom of the hill on the banks of the taggerty river. There is a 1.5 to 2 km walking track leading strait up the side of the mountain from the huts to Ski run 21. I have been to the area of the huts, but have not seen. Maybe someone will know? Correction to my first comment ; The old map with ski run information is a 'Gregory's' Marysville, and not a Broadbent. Just checked your wiki... My father is involved with Mt Wills and is a former president of the ski club. The rope tow is still operational and gets used but only by members and very occasionally. I've not been there in a long time but I remember it being used in the mid 90s. This is a link to some cool pictures & more info on Mount Wills. The Marysville division of the SCV held its inaugural meeting on May 28, 1939, with 20 people signing up and Berry Higgs elected as president. In 1940, a basic hut was built at the foot of the Snowy Hill run, accommodating eight people. It had an earth floor which was often soggy and wet and no bunks. In the same year, Marysville SCV members and the Rover scouts joined forces to cut a trail over the top of Snowy Hill. cin and Highplainwarrior like this. I am now inspired to do some more exploring and fosiking in the area after reading link. 'With the onset of war in 1943, enthusiasm waned and it was not until 1947 that interest was re-kindled and large areas were cleared for skiing at Snowy Hill. By 1955, a four hectare gentle slope had been cleared with ski runs and playgrounds constructed around the area today known as the Berry Higgs Playground. Meanwhile, the original cross country ski trails at Lake Mountain were ex-logging roads that had been used post-war as access roads to the Federation and Sandstone ranges. There was a ski slope on Mt Carey Barrington Tops. Is it possible that highplainwarrior is in fact Bogong reincarnated? just a thought! No. Bogong would not have misspelled "fossicking". climberman, Rimey, cin and 2 others like this. Bogong's book is out, I read somewhere. So did I on FB. Mt. Wills here in Vic. has an old ski rope tow and a once cleared but now overgrown downhill slope that was functioning back in the day .There is the Tallangatta ski club lodge there but the summit area gets more snow these days and the Mt. Wills summit hut is superb and free. The Wangaratta Ski club have an old rope tow on Mt. St. Bernard but it does not get much use because of the lower elevation and aspect. Re the earlier comment about using portable rope tows. I like the idea but if enough people started catching on the resorts would cry foul and the authorities would step in. Nice thought though - I'm not fussy, 200m of vertical on south side of Spion Kopje would suit me fine!